Ponzano, 22 February 2006. 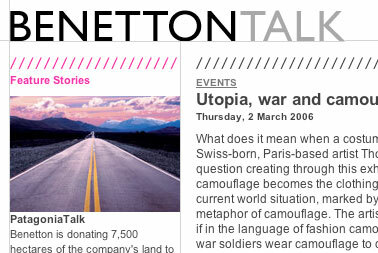 The benettontalk.com site now has a new English-language space open to all. A blog where visitors can express their thoughts and comments, and write about ongoing global issues in the news � the environment, rights, diversity, local communities, development � that often run the risk of disappearing under the avalanche of information that bombards us every day. The blog is a fast, direct way of creating a dialogue with the community, to talk about our experiences and hear those of others, to exchange views, discuss things in-depth or simply give an opinion. Not only. This blog springs from the desire to search out and propose solutions to tangible problems, highlighting initiatives by individuals, local communities or organizations, with whom to create a constructive relationship. A dialogue to give visibility to positive ideas and solutions for a sustainable future. The blog is sponsored by Benetton, a company known for its concern about social issues and its interest in media evolution, but it does not necessarily reflect the corporate view. In addition to the blog there are two micro sites � in seven languages and regularly updated � which deal more extensively with specific subjects: Patagonia and dying languages. Visitors may post their comments directly or write an article on these or other subjects and the article could be posted on the site. The next micro site will be a collaborative effort between BenettonTalk and PEN American Center, presenting together a series of conversations on the subject of �Faith and Reason� for the PEN World Voices, The New York Festival of International Literature (25-30 April 2006). PEN American Center is a human rights and literary association founded in 1922 that draws together some 3000 leading writers, editors and translators. It works to overcome national, ethnic and racial barriers and to promote understanding among all peoples.